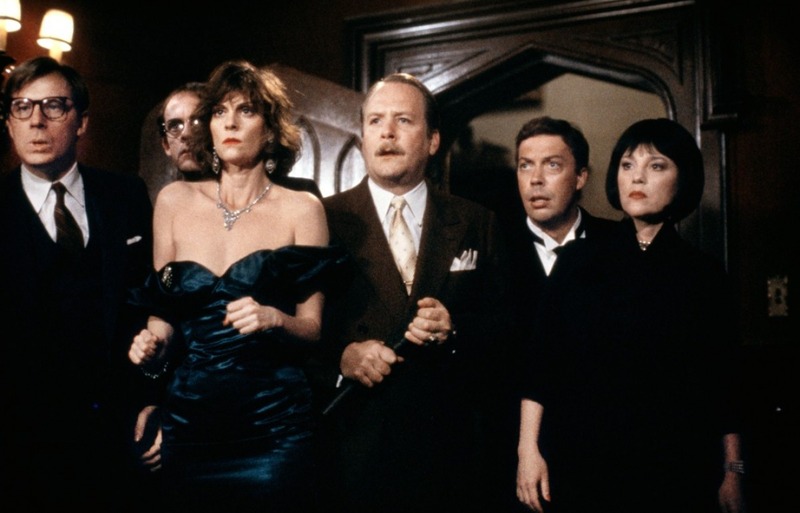 A madcap whodunit comedy, Clue has a large cast breathlessly running around a spooky mansion for 90 minutes. The film runs out of steam and ideas long before the convoluted plot ties itself into an unfathomable knot. On a stormy night at an isolated mansion, the butler Wadsworth (Tim Curry), the maid Yvette (Colleen Camp) and the Cook (Kellye Nakahara) prepare dinner. Six strangers are invited, and they have been instructed to use colourful pseudonyms: Mrs. Peacock (Eileen Brennan), Mrs. White (Madeline Kahn), Professor Plum (Christopher Lloyd), Mr. Green (Michael McKean), Colonel Mustard (Martin Mull) and Miss Scarlet (Lesley Ann Warren). The apparent dinner host also shows up: Mr. Boddy (Lee Ving) claims to be blackmailing all the guests. He is soon mysteriously killed, as is the Cook. Wadsworth leads the guests on an investigative quest to search the mansion and unmask the killer, but a stream of apparently uninvited strangers keep on ringing the door bell and also getting themselves killed, including a lost Motorist, an off-duty Cop, and a Singing Telegram Girl. All the dinner party guests have motives, and it's up to Wadsworth to untangle everyone's movements and reveal the truth. 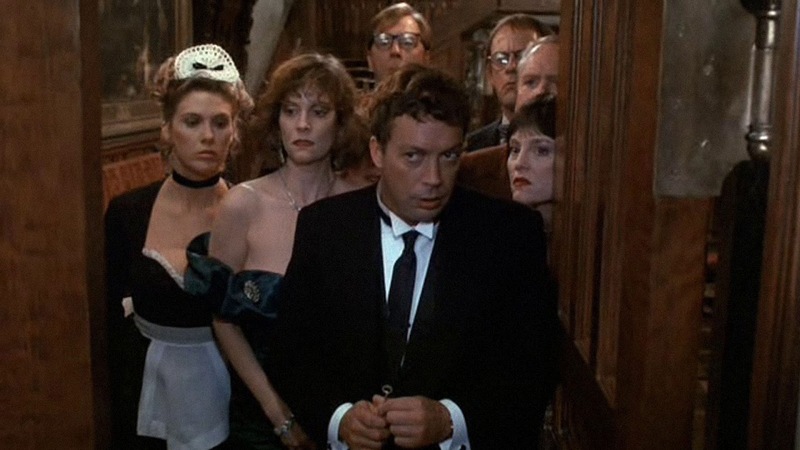 Based on the popular board game, Clue stumbles on a most cluttered plot, and disintegrates as the bodies pile up and the invited guests dart aimlessly from room to room. Director Jonathan Lynn, who co-wrote the script with the usually sharper John Landis, never finds neither the humour nor the focus necessary to build an engaging narrative. By the time Wadsworth runs through (literally) what happened (and there are three variations to the ending), the only thing that matters is that he gets it over with as quickly as possible to end the tedium. Tim Curry does enliven the proceedings somewhat with his sheer energy and willingness to ham it up, but the rest of the decidedly B-list cast members are quickly lost among the furniture and interrupted by the continuously ringing doorbell introducing yet another nondescript victim. Sad to say, but Clue does not have a clue.